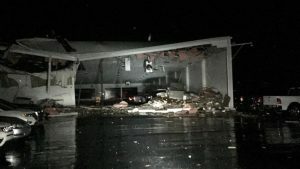 The National Weather Service says six tornadoes have now been confirmed across the Ozarks from the severe weather that hit late Friday night into early Saturday morning. One of those twister hit south of Aurora and killed one person at the Aurora Inn. Other tornadoes hit the ground near Monett, Seymour, Hartville, Republic, and Billings. Four of them have been classified as EF-1’s, while the other two were EF-0 tornadoes.